Put Down the Tweezers! HOT Price On Electric Hair Trimmer After Coupon Code! 【Automatic grinding system】: Carefully developed the bullet type suspension head automatic grinding function, creating a perfect fit the nasal cavity of the three-dimensional head.High safety factor, durable, do not hurt the nasal cavity. 【Rotating head design】: R-type fillet tip, Rotating speed 6500 rpm per minute speed.Pruning more secure, comfortable paste the skin, enhance the pruning effect.【360 degrees all-round pruning】：Internal rotation blade, trim evenly. Multiple cutting faces, capturing extra nose hair, and removing nose hair from the roots. 【Multi-function】:Multi-purpose machine to solve your different needs, 2 different types of cutter heads, replace them at will for trimming the nose hair, ear hair, beard,Sideburn,eyebrows, and fully show the male charm.【Lightweight and compact】: Stylish and portable and space saving. 【 Whole body washable 】Wet/Dry use, Waterproof and Easy Cleansing, Can be used in the shower, Washable and removable cutter head, comes with a dust-proof cover to protect the cutter head. 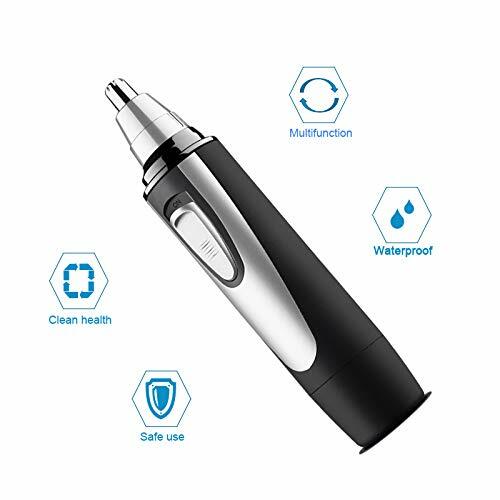 【High efficient and power saving】: This nose trimmer operates on just 1 AA battery (not included)【Rotary head fixed rotation】: Both the suspension head and Internal rotation blade are rotating.